If you’ve heard me talking about email marketing software, you’ll know that I think this is one of the tools I think small businesses should pay for. It’s an investment for your business and one that will help you achieve your goals. In fact, did you know that for every £1 invested in email marketing, there is an average of £38 return on investment? I thought that might interest you! So, with a myriad of email service providers to choose from, what do you need to know to make your choice? How easy the email marketing software to use? You’re busy and have a million things to do each day. The last thing you want is to choose a tool that is too complicated to use. When it comes to email marketing, the software you pick needs to be easy to use. You should be able to log into it and understand relatively quickly how to put together an email. If you can’t do that, then what you’ve chosen isn’t for you! Is there an intuitive drag and drop email builder? Can you easily insert action blocks to encourage your readers to take action? What do the available templates look like? Will your email stand out if you use them? Are there enough templates to suit your needs? Is it easy to add contacts? How easy is it to add your own images and files? Are there any list growth tools available? Make sure your time is spent wisely when choosing the email service you use and pick something that doesn’t have a huge learning curve. Does it have templates that work on every device? If you’ve sat in on any of my talks about email marketing, you’ll have heard me say that more than half of all emails are opened on a mobile device. That means that people are using smartphones and tablets more and more to read emails. Imagine receiving an email, opening it up on your smartphone and having to pinch and zoom in and out of an email. It’s not the best experience, is it? Frustration will lead the reader to give up and your opportunity to have them take the next action will be lost. That’s why it’s important to make sure that the templates provided by email marketing services are mobile responsive. This means that whatever device the email is opened on, your email will be sized perfectly for it and look great. If the email marketing software you’re thinking of doesn’t have mobile responsive templates, give it a big swerve! More than half of emails are opened on mobile devices. Pick an email service that has mobile-friendly templates! Will it let you automate your email marketing? For a long time, small businesses have thought that email automation isn’t for them. In fact, it’s the opposite. Let’s come back to how many things you have to get done on any given day. 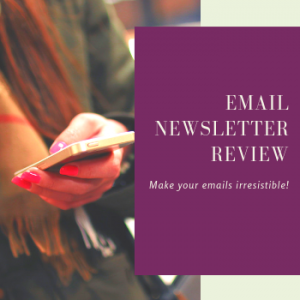 Wouldn’t it help you if some of your email marketing just happened automatically? Yes, of course, you would have to set it up in the first place, but after you had done that, you could just forget it. At any given time, I have at least 4 or 5 automations set up. Once I’ve set them up, they run at the intervals I’ve picked. What a great way to engage with customers and potential customers alike. And it all happens with the minimum of fuss. So, check the email marketing software you’re thinking of using to see if they offer automated emails. If you’re not sure what you would put in an automated email, read this blog post. Yes, there are free options for email marketing out there, but this is one marketing tool you really should pay for. Why? Because you don’t get everything you need with free versions. There are always catches because, at the end of the day, they want to get you to a place where you do have to pay. So, here’s what you have to look out for when looking at payment plans. Is the provider list-centric or subscriber-centric? What does that mean? Well, a list-centric provider will charge for the total number of contacts in your account. So, if you happen to have one contact in multiple lists, you will be charged for each list the subscriber is a member of. A subscriber-centric provider will charge you for each unique contact, regardless of how many lists they are a member of. In addition to the above, check whether there are any hidden charges, for example, you may be limited to the number of emails you can send a month, or you might have to pay extra for support. Watch out for any hidden charges when choosing your #emailmarketing software! Are there resources to support you? Whenever we try new tools for our business, it’s helpful to have a bit of guidance. However you like to learn, check to see if the email service you’ve picked has resources you can use. Typically, there should be some sort of getting started guide in the shape of a blog, video or webinar. This can be particularly helpful if you need to get up and running in a hurry. And what about ongoing education? Does the service provider you’re thinking of update their resources when they update their software? All of this is really useful when you don’t always have the time to figure it out yourself. Can you talk to someone when you need help? One of the most frustrating things that can happen is being up against a deadline and not being able to get your email out on time because something’s not quite working. If you’ve been in that position, it’s tough and you can spend a lot of time trying to figure out what’s gone wrong. That’s why one of the best pieces of advice I can give you when picking your email software is to choose a provider that has a telephone helpline. You know, someone you can actually pick up the phone to and talk through what isn’t working. Because when you’re trying to get your email out, the last thing you want is to have to email your support question and be told you’ll get a response in 24 to 48 hours! Pick an email software that comes with telephone support. You never know when you’ll need it! Does the email software work with your other business systems? Here’s the thing. As a small business owner, you do not want to spend your time on manual processes. That’s why the tools you use need to integrate, or, as I like to say, play nicely together. Think about the other systems you use to run your business. You might have a CRM (customer relationship management) software, or your invoicing platform, maybe you collect leads from your website with a pop-up form. It could be any number of things. Now think about the amount of data these platforms generate and how time-consuming it will be for you to manually move that data from one place to another. That’s why you need to look at the integrations available for use with the email marketing software you’re planning on using. What will you pay for what you get? We’ve already looked at list-centric vs. subscriber-centric providers. Now you need to look at what you’ll pay overall, and what that gets you. Now’s also the time to look at other marketing tools you use that might be better brought under one roof. For example, if you regularly send out surveys or automate your social media, does your email service provider offer these additional services? When you add it all up, it may cost you less to have one provider for all those things, rather than pay separately. And don’t forget to look out for any additional charges. This will impact your overall spend on email marketing, which still is a good, low-cost option for small businesses. Remember, for every £1 spent on email marketing, there is an average £38 return on your investment. So, now you know what to look out for, let’s look at how to email platforms stack up against each other. 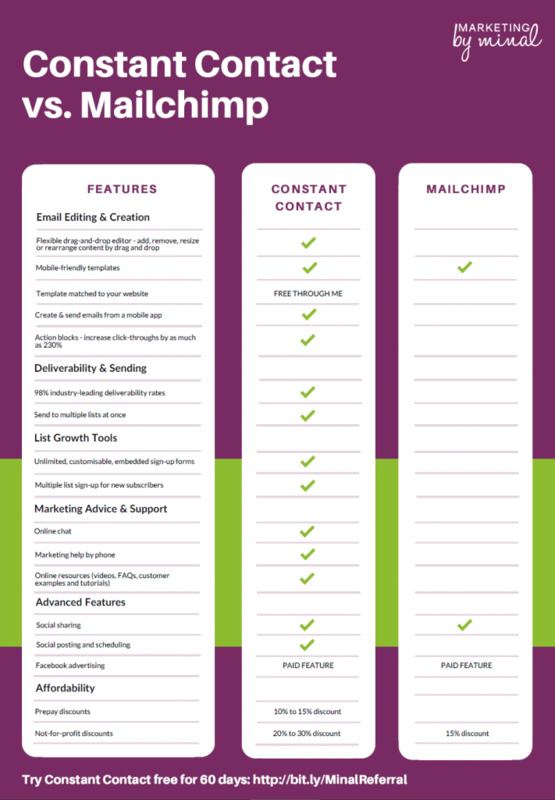 I’ve picked what I think are the two email service providers small businesses use. If you click on the image, you’ll be able to download a PDF to keep. So, now you know what to look out for, time to get started with using email marketing for your business. I use and recommend Constant Contact because of all the reasons I’ve been through in this post. What’s more, you can try it for free for 60 days! No credit card details needed – just set up your account and get started.